Henry Tudor, the future King Henry VII, had the misfortune to be born in 1457, and thus grew up in the most turbulent period of the Wars of the Roses between the rival families of Lancaster and York. His formative years were haunted by violent death. His mother, Margaret Beaufort, through whom he inherited his distinctly sketchy dynastic claim to the throne, belonged to the family of the Dukes of Somerset: firm Lancastrians. Her father had committed suicide following dubious conduct in the wars against France when she was one year old, leaving her a great heiress. In consequence at the age of ten her marriage was arranged to Edmund Tudor, half-brother to King Henry VI. She was still only thirteen when Henry, who was to be her only child, was born. Henry was never to see his father, who was captured in battle and imprisoned in Carmarthen castle, where he died of the plague two months before Henry's birth. Margaret then married Henry Stafford, the son of the Duke of Buckingham. In 1461 Henry's paternal grandfather, Owen Tudor, found himself on the losing side at the battle of Mortimer's Cross and was beheaded. 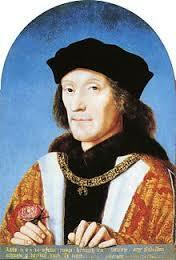 The new Yorkist King, Edward IV, granted his supporter William, Lord Herbert, guardianship of young Henry. In May 1464 Margaret's cousin, the Duke of Somerset, was also defeated in battle and executed. Henry seems to have got on well with his guardian, but disaster struck again in July 1469, when Lord Herbert's forces were defeated at Edgecote, near Banbury. He was beheaded the next day. Henry, aged twelve, witnessed the battle, and not surprisingly was terrified. In autumn 1471 the Lancastrian forces were defeated at Tewkesbury and the deposed King Henry VI was murdered in the Tower, leaving Henry Tudor, now Duke of Richmond, the only remaining Lancastrian claimant to the throne. He managed to flee to Britanny, where he stayed for the next thirteen years, constantly fearing kidnap by English agents. His mother did not see him at all during this time: meanwhile her second husband, Henry Stafford, died of wounds received at the battle of Barnet; and she again remarried; this time to Lord Stanley. Margaret proved to be a great survivor. Despite her strong Lancastrian links, she managed to stay on friendly terms with the Yorkist regime, and was even given the honour of being a train-bearer for Queen Anne Neville at the coronation of Richard III in 1483. But soon after this she became involved in plotting. In 1485 her son Henry, with the backing of the King of France, landed in south Wales and mustered supporters. His victory over Richard at Bosworth was largely due to the fact that the forces of his stepfather Lord Stanley changed sides in the middle of the battle. Richard was killed and Henry was crowned King, essentially by right of conquest. Henry once told the chronicler Philippe de Commynes that most of his life had been spent as a captive or fugitive, as a result of which he had become extremely (we might nowadays say pathologically) suspicious. No modern psychologist would be in the least surprised at this: the wonder is that he didn't turn out far worse!